"Was it better when soap smelled of marriageable people?" The perils among the tragedy that was the Holocaust have been chronicled many times and in many different ways on film. However, there are fewer projects that deal with the years immediately following World War II and what those years meant to the Jewish people. 2002's Almost Peaceful takes place in Paris, France circa 1946. The focus here is a small group of Jewish Parisians, Albert and Lea, who run a tailoring shop out of their apartment. Albert and Lea's children are in the south of France, at summer camp, allowing the couple to have some time to be alone together. Still, they don't have that sense of security that most of us these days enjoy due to the recent tragedies during the war, so they anxiously await letters and drawings from the children. One of the other workers is also holding out hope for letters or any word from his family members, whom we soon come to realize were lost in the war. Having not given up hope, though, this man has rented an apartment in the neighborhood, waiting to hear from or about his assumedly deceased loved ones. An unemployed actor and his pregnant wife also work at the shop, along with the youngest workers, Maurice and Joseph. Maurice spends much of his free time with prostitutes at the local hotel, while Joseph goes to the police to get his papers in order and recognizes a haunting figure from his recent past. Director Michele Deville (Benjamin, La Lectrice) has crafted a nice little tale of hope without getting overly sentimental, which would have been easy to do in a film like this. It's difficult enough making a feature about the horrors of the Holocaust, but when you have to see fathers still holding out hope that they'll get to see their lost children and spouses again, sorrow is taken to another level. Almost Peaceful is also a reminder that all people go through similar struggles regardless of their religion or what time period they are living in. We see a husband and wife struggling to keep their romantic spark alive while dealing with the temptations of others. Still, the movie didn't fully connect with me, and the reason for this is a slight lack of character development for the main couple, Albert and Lea. The performances by Simon Abkarian and Zabou Breitman, respectively, are good yet subdued. A bit more passion and punch from this pair might have added quite a bit, but seemingly the way these characters were penned in the script is to blame for the slight miss here. Almost Peaceful should be commended for its originality, but it just wasn't as emotionally powerful as it should have, let alone could have been. Hopefully, a better script will come along soon and treat the post-Holocaust subject the way it deserves to be treated. Image Transfer Review: The anamorphic 1.85:1 widescreen presentation looks very good, with well-rendered, yet intentionally muted colors throughout. The images are nicely detailed, with nice sharpness that is aided by solid blacks and shadow levels. Things don't look as vibrant and spectacular as more recent, bigger-budgeted films of the same nature, but this is still a solid transfer. Audio Transfer Review: The Dolby Digital 2.0 track is perfect for this kind of film that is almost entirely dialogue-driven. The score is about the only sound aspect that travels to the surround speakers. Everything else stays up front, including the consistently crisp dialogue. Photo Gallery: A collection of stills from the film. Extras Review: The only extras here are four previews, a photo gallery, and a bio of director Michel Deville. 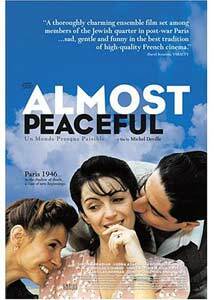 Empire Pictures presents Almost Peaceful on a nice if unspectacular DVD that features solid audio and video presentations. There are a couple of extras on board, but nothing to shout about.